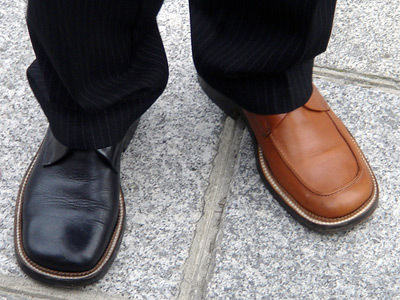 Home » Brown Shoes With Black Pants: What’s the Verdict? Brown Shoes With Black Pants: What’s the Verdict? A lot of style-confused guys look at their black trousers and think their brown shoes would probably look good with that ensemble. Well, son, allow us to set you straight. A smattering of brown attached to a whole lot of black, looks like you just waded through a barn and forgot to wipe your feet. It is similar to purchasing a sleek black Dodge charger, and then putting a set of rusty steel wheel hubs from a Ford Gremlin. With that said, we realize this is 2012, and a lot of designers don’t mind a little flash on the tootsies. Consider chocolate brown shoes with some black highlights. Then throw on a brown jacket to help tie everything together. As a rule, your shoes should at least be within the same color family as your pants, and keep in mind, your belt should always match your shoes. What you are left with, here, is black pants, black shoes, black socks, and a black belt. Sound boring? Well, the real magic of this ensemble will be the silhouette you leave behind. When choosing an all-black outfit, make sure that it fits nice, and carves out your physique well. Pleated pants can ruin an otherwise sleek look, so choose the shapes of your black pants and jacket with care. Our final advice is that black on black can never be baggy, wrinkled, or dull. Black must always be sharp, crisp, clean, and have the same level of intensity across the board. In other words, make sure the fabric is comparable.